[EUREKA, MO] – With a standing-room only crowd overflowing out of the Champagne Ballroom at the Paris Las Vegas, the RVBusiness magazine 2018 Top 50 Dealers Awards reception honored North American RV dealers on Wed., Nov. 7, during the annual RV Dealers Association International Convention/Expo for their outstanding customer service, community involvement and general excellence in overall operations, including local RV dealer Byerly RV. “The RVDA Convention is a great place for the dealers in the industry to gain knowledge to help grow their teams. The events and seminars provided by the vendors and supporters of the RV industry are second to none. It’s also a privilege to be in the room with the 50 best dealers in North America and hear how each of them go about delivering a great experience for their customers,” said Byerly RV General Manager, Warren Patton. 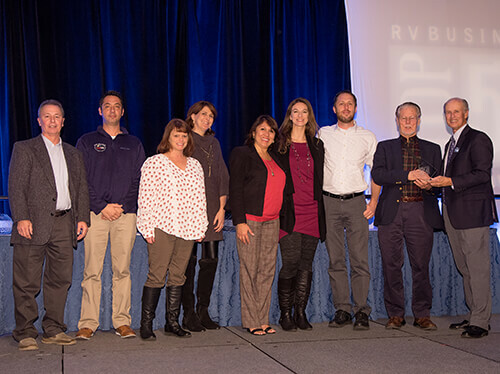 The process for determining the 2018 RVBusiness Top 50 Awards was an involved one, beginning with harvesting qualified nominees in early summer from RV manufacturers who nominated dealer partners based not just on sales volume but whom they felt exemplify RVB Top 50 qualities and practices. Those dealers were invited to complete the program’s extensive application. Then, an expanded 11-person panel of independent industry insiders met in an intensive two-day, closed-door session in early September to review all the applications and complete their selections. “We have always put the highest priority on the customer experience, so it’s an honor to be recognized by our industry as one of the top dealerships in North America. The RV lifestyle is becoming more and more popular and the industry keeps growing. After serving the St. Louis RV market for 70 years, and speaking about the benefits of everything the RV lifestyle has to offer, we’re thrilled to help more and more people create lasting memories,” stated Byerly RV General Manager, Warren Patton. For more information about Byerly RV, visit www.byerlyrv.com or call 636-938-2000. 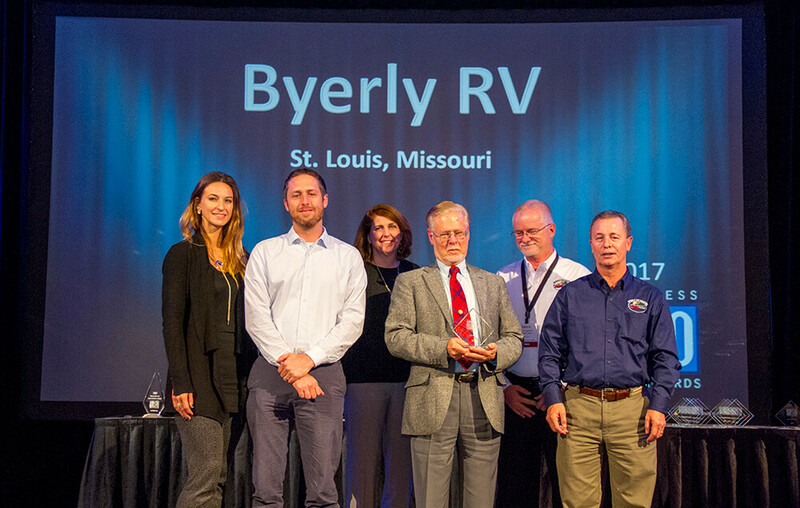 EUREKA, Mo – RVBusiness magazine recently named local dealership Byerly RV, located at 295 East 5th St in Eureka, as one of its 2017 Top 50 RV Dealers in North America. “Byerly RV has always been about offering the highest quality customer experience in all aspects of the RV experience: Sales, Service, Parts, and Rental. This philosophy started with our manufacturing roots, our development into an RV parts resource for customers, and continues with our low pressure/high value sales pitch. We have consistently been a voice within the industry through our contributions to the RV Learning Center and our long-term relationships with manufactures. And we have always been proud to support and strengthen our local and state RVDAs,” stated Byerly RV Owner and President, Russ Patton. Program coordinators expanded the judges’ panel this year, bringing perspectives from even more areas of RV-industry business specialization. The extra hands also helped make lighter work of the extensive applications received, according to Sherman Goldenberg, publisher of RVBusiness magazine and founder of the Top 50 program. “As a whole, our applying dealers not only gave us more data this year, but they also went to great lengths to tell us their stories and let their personalities shine through,” Goldenberg said. “It was a tough job for the judges to narrow it down. Those who made the cut should be very proud of that achievement.” The 2017 class of RVBusiness Top 50 dealers were honored at a Nov. 8 awards reception in front of an all-industry standing room only audience of over 400 during the 2017 RV Dealers Association (RVDA) International Convention/Expo at Bally’s Las Vegas, presented in cooperation with the RVDA of both the United States and Canada and underwritten by the program’s sponsors: Airxcel, Ally Financial Inc., Cummins Power Generation, Dometic Corp., Freightliner Custom Chassis Corp., Lippert Components Inc., NTP-STAG, Protective Asset Protection, Truma and Wells Fargo CDF.